Going on a Disney vacation with your baby or toddler is an exciting time for many parents — but as you might imagine, taking your child’s usual gear and routine on the road can be a little tricky! One part of that daily routine is, of course, diaper changes. Where will you change Baby? What do you do if you need supplies quickly? Luckily, we’ve gotten the scoop on all things diaper at the Disney parks, and there are lots of options. Walt Disney World and Disneyland make the process logistically easy, in order to help families through every diaper contingency. For routine diaper changes, it doesn’t get much easier than at Disneyland and Walt Disney World. The Disney parks and Disney resort hotels provide so many readily accessible places for a quick diaper change. You’ll never have to walk any farther than the closest bathroom to find a clean and convenient changing table. There is at least one (and usually more) in every bathroom. Consider packing your own changing pad to keep things clean and comfy for Baby. Want even more changing table space with other amenities for diaper changes? Head to one of the Disney Baby Care Centers. There’s one in each park at Walt Disney World (Magic Kingdom, Epcot, Hollywood Studios, and Animal Kingdom) and at Disneyland (Disneyland Park and Disney California Adventure Park). At the Baby Care Centers, parents will find a number of additional changing tables plus plenty of baby supplies for purchase. Plus, they have quiet spots for nursing, pumping, or bottle feeding. If you need diapers (and are in a park) simply head to the nearest Baby Care Center. The Baby Care Centers stock a limited supply of wipes and Huggies® diapers in a few different sizes. Not every diaper size will always be available, but there is always enough variety to work in a pinch. The most popular sizes — 3, 4, and 5 — are the most commonly found. Alternatively, you may be able to find diapering supplies in regular bathrooms too. Select bathrooms in the Disney parks sell diaper-changing kits in wall-mounted vending machines for about $1.50. Those quarters you packed for pressed penny machines could do double duty for meeting your diaper needs. One last on-property location where diapers are commonly available is gift shops. Larger shops, in places like Disney Springs or in the Disney hotels, commonly stock Huggies® diapers in several sizes just like in the Baby Care Centers. Headed to a water park or pool? Disney has thought of that as well. There are Huggies® Little Swimmers® available for purchase in the gift shops at Typhoon Lagoon and Blizzard Beach as well as swim diapers in most Disney hotels for use in the pools. If you need a larger supply of diapers, there are plenty of other options short of packing a suitcase full of diapers for your Disney vacation. Consider ordering diapers from an online retailer and shipping them ahead to your Disney resort hotel. Put your name and check-in date on the box and the hotel will hold it for your arrival. Or, you could look into one of the grocery delivery services in Orlando or Anaheim. Thankfully, diapers can be delivered just like any other essentials your family might need. Bring a change of clothing or two along with you in your park daypack for any unexpected diaper messes. Pack whatever you might need to clean up Baby, your stroller (and even yourself). Also, if you need a clothing change, Disney gift shops are always nearby ready to sell you either baby or adult clothing that can double as an outfit change and souvenir. If your toddler is potty training, keep in mind that the Disney Baby Care Centers and select resort hotels and gift shops stock Pull-Ups® Training Pants in addition to diapers. The Baby Care Centers also are the only place you can find smaller kid-sized toilets. 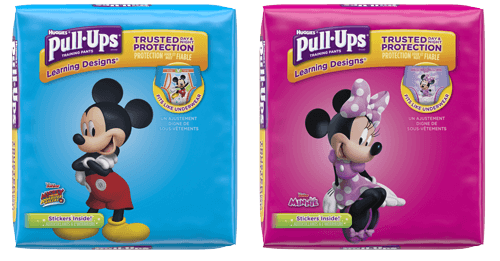 Disney certainly makes it as easy as it can be for little ones who are potty training! Some of the information in this post may have changed after this writing. Please visit Guest Services online at Disneyland or Walt Disney World, or ask Disney Parks Moms Panel to confirm current policies.